A new URL shortener service mines a crypto currency in the browser while the user waits to access the link. The person that shares the link can set the amount that needs to be mined before the content can be accessed. An easy way to get paid for sharing stuff on the web. 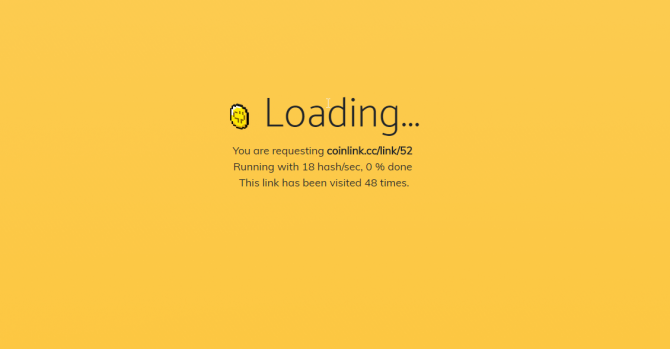 The service is called Coinlink and takes 5% of the revenue from the user sharing a link. When the user visits the link and waits till redirection, the anonymous cryptocurrency Monero is mined. An example of how this works is here: https://coinlink.cc/link/51 and here https://coinlink.cc/link/52 (We’ve set the difficulty to low on the first link to demonstrate, in reality it might take much longer before you can access content shared through this service, the second link uses the highest difficulty). This new way of sharing content is an excellent new way for online pirates to make money off their shared content. Where users are used to wait because services like RapidShare already showed a timeout to the user, to encourage them to upgrade to a paid subscription, the waiting time is now actually useful for the sharer.